Is it just me, or is anybody else noticing that, lately, the Dolphins are going to great lengths to make their presence known. They seem to be everywhere; showing up in the news, on Youtube, all over the social-media networks, and in our meditations and dreams. If you haven’t seen the footage of the magnificent stampede of over a thousand dolphins off the California coast, please click on the links below to check out their latest antics. 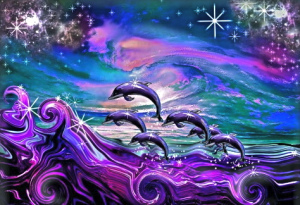 ☯ For those of you who followed my old blog, The Angel Diaries, you know that I have been blessed to be able to connect, at a telepathic level, with a pod of Atlantic Bottlenosed Dolphins, whom I’ve affectionately nicknamed “The Crystal Dolphin Pod.” They’ve been silent for the last few months, and for awhile I hadn’t felt the familiar pull to connect with them like I had before 12/21. But suddenly they’re back! And what they bring to the table is nothing sort of astonishing and exceptionally insightful. It’s important for us, as Human Beings, to understand that the Cetacean Race (which includes the dolphins and whales) are right on par with us – or are actually far more advanced – intellectually, spiritually and physically. Their nature is playful, upbeat, jolly, and they are bonded for life with their families, or pods. It’s not a fluke that several years ago a group of scientist awarded the dolphins the designation of “Non-Human Persons.” They are entirely without artifice, ego or self-serving motivations. Their sole reason for being here on Earth is to help us, the Human Race, to rediscover our natural connection to Gaia and to God. They want to help us to remember that we are Sovereign beings, and that this planet is our home and we must honor and respect it. ☯ You’ve felt it on more than one occasion, haven’t you? That breathless feeling of love and connectedness when you see a picture of a dolphin, or even better, when you are in the presence of one. They are our Brethren, and deep down inside, we know it. This week, The Pod returned to me during a fairly intense guided meditation. They offered profuse apologies for being missing-in-action, and expressed a heartfelt desire to resume communication. Of course, I’m elated to have found them again! And even more so, to be able to once more pass on their transmissions to all of you. I’m choosing to do this via a question and answer format, as I want my messages to have a kind of interactive feel for the reader. I’ll begin with a description of my meditation journey, and then I’ll move on to the conversation portion from there. I was at home doing a Quantum Vortex meditation, which is a part of my regular daily practice. Having finally reached a state of peace and relaxation, I was at the point where I’m to envision my golden soul-light flooding every cell and atom in my body. I watched with my inner vision as the cells began to spin counter-clockwise, glowing bright gold. But then the vision changed. Circling each cell was a ring of dolphins, swimming and spinning faster and faster until they became a bluish-greenish-golden blur. The vortex continued to spin rapidly around me, counter-clockwise, and before I knew it there were dolphins swimming inside! I felt them gathered all around the outside of my aura, and then I saw them circling a separate vortex which was spinning up and around my chakra-column; up and far above my head. They pulled me upwards along with them, and I saw myself grabbing onto the dorsal fin of a the largest one – a white dolphin – whom I recognized as the dominant male leader of the Crystal Pod. He pulled me further up and out of my Human self, following the others through a star-studded nighttime sky. Then, we were in the water, swimming through an underwater cave, leading up into a small stone grotto. There was a set of rocky steps in front of me that led to a narrow sandy road, lined with daisies. I released my hold on the dolphin’s fin and climbed out of the water and up the steps, following an unfamiliar road to a very, very familiar place. The Temple! I was at the Temple, the Dolphin Temple. How funny… I had never arrived this way before! I was on Maia. For my newer readers and for those unfamiliar with The Pleiades, Maia is the fourth brightest star in the Pleiadian cluster, located in the constellation of Taurus. She’s one of the legendary “Seven Sisters.” I’ve known and visited this particular Temple since childhood. It stands along a large bay, which is filled with playful dolphins. Hugging the edge of the coastline, it’s open on all four sides and is lined with tall, wide columns, appearing to be made of a smooth, pure white, opaque quartz crystal. The water surrounding the Temple is a translucent turquoise, and the sky always has the look of it being just before sunset. Like it’s always about 4:00 in the afternoon. This Temple is relatively small and is comprised of only one open, airy room. Scattered all around on the floor are big, fluffy cushions; red and bright pink, with silver and gold beads and little mirrors sewn on. These, I have learned are for the visitors to recline on while they read the Record Books, which sit upon white pedestals in the corners of the room. I know that this is a place where one can go to comfortably study their own Akashic Record Books. I’m not exactly sure how the books actually arrive there – but I do know that if we set the intention, our Book will just appear! I go here often during meditation and dreamtime, to study. This Temple is also overseen by a beautiful female Angelic being, who has identified herself to me on more than one occasion as “Athena.” She is tall, with dark, upswept auburn hair and the clearest, whitest skin. She always is dressed in a white gown, and wears rows of wide gold bracelets on each arm. She sits on a golden, high-backed chair, which is set upon a small platform. Her demeanor is kind and motherly, and often she’ll beckon to a visitor to climb the 4 or 5 steps up to the platform, in order to kneel before her and receive a blessing. She then will take the guest’s hand or lay her palm gently upon their head, but she never, ever speaks. I do know that a visit to the Dolphin Temple signifies that you are ready to receive further enlightenment and knowledge. Everyone has access to this wonderful place, and you have only to clearly set your intention in order to visit. Do this before you go to sleep or begin your meditation. “Yes, yes. The upgrades to the DNA and the expansion and revelations, yours and ours and that of all life gracing Gaia. Yes, much change is afoot. Glorious times. We are busy. All of life is growing and expanding. This is the transfiguration, which in and of itself is not to be an expedited process. But a gratifying one, nonetheless. As you already are aware, we tend the grid. We are here to facilitate the changeover, keepers of the flame you might say. Although that is not exactly an apt comparison, is it not, given our watery locale (laughter)! I’m so happy that you’re back. I’ve missed your visits. But what can you tell us about your sudden appearances in the news, and the stampede in California? Will you be sharing with more of us, in this way? Copyright©Bella Capozzi. All rights reserved. You may copy and distribute this material as long as you do not alter it in any way, the content remains complete and you include this copyright notice.